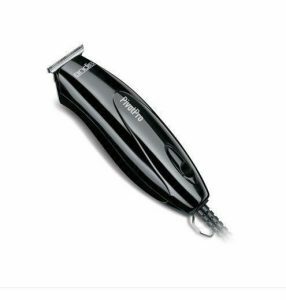 The Pro Corded Beard Trimmer from Andis is an excellent beard trimmer even though you may not like the attachments and the lack of the brush. Other models such as the Slim Line Ion comes with a beard brush which is important for grooming long beards. Also, it is not for haircuts unlike other models such as T-Edger, Power trim, Experience Rax and so on. Despite these facts, the users love it and they say it is the best one they have used when comparing with beard trimmers from other brands. There are four attachments: 1/16”, 1/8”,1/4” and 3/8” which is 1.5 mm, 3 mm, 6 mm and 10 mm. it comes with a bottle of oil so you can lubricate it for best results. The tool makes 3500 strokes per minute. It is four times more power than regular beard trimmers with magnetic motors. The stainless-steel T-blade ensures that there is no skin irritation, redness or soreness. It is perfect for trimming beards, mustaches and necklines. The user can trim, outline, design and style their facial hair with this. The price is less compared to many other beard trimmers so it does not matter whether it comes with a brush or not. It is quite long which is 6 inches in length. As mentioned before, it does not come with a brush and you cannot use this to cut hair. It is not completely silent nor too noisy. The reason you might not like the attachments is because there is no clear indication of their size and they are made from soft plastic. They can break anytime. Besides that, you will love the casing, blade and the motor. When you are in a rush, you can use this. It is perfect to be an on-the-go trimmer. It speeds up grooming time. It will do a good job on the sideburns, mustache, jawline and beard. It is suitable for beard trimming and sideburns shaping. You can also get the replacement blade for this device. The blades are extremely sharp and if you have skin that is light, it can cut easily. Be careful when trimming around areas like around the ears because there the skin is light which can result in a cut. You will love the 1/16th attachment which you will not find occasionally in most beard trimmers. The beard trimmer is durable and strong.